Have you ever sat in a doctor's waiting room and wished, "What if there were a magazine I would actually like to read here?" Usually, the selection available seems to be geared 90% toward women and children, and 10% to men with whom I apparently have nothing in common. Why not a poker magazine? Okay, this probably won't happen, unless your doctor's office is in Las Vegas. So, you're probably going to have to bite the bullet and subscribe to one yourself; not a bad investment. For one thing, you get generally good advice from poker magazines and, for another, you get the advice in bite-size pieces, delivered on a regular basis to your mailbox. 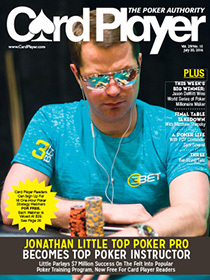 The good thing about Card Player magazine is that it is the established periodical in the field, and it has a whole team of great writers, including Daniel Negreanu, Mike Sexton and Phil Hellmuth, Jr.
From the publisher: Card Player magazine is the foremost authority on all things poker. Inside Card Player, you'll find page after page of informative playing strategy, poker articles by some of the greatest poker players in the game today, upcoming tournaments, as well as major poker tournament results. All In Magazine is the new kid on the block. It stopped publishing for months on end - never a good idea for a magazine - but began publishing again in 2009. I used to subscribe, and it wasn't a bad magazine at all. From the publisher: All In is the world's leading poker magazine. Each issue delivers world-class instruction from poker superstars such as Howard Lederer, Chris "Jesus" Ferguson, Phil Gordon, and many others. In addition to poker strategies and lessons, All In brings you profiles and interviews with the game's biggest names, lifestyle features, travel tips and highlights, book reviews, and stories on poker culture across America. Featuring brilliant photography and design in the form of an upscale perfect-bound magazine, All In is a must-have subscription for any serious poker aficionado. Since first writing this article during the online poker boom, a lot of things have changed. Card Player Magazine is still around, and is still the dominant poker magazine. Bluff Magazine seems to have gone the way of the dodo, with only the website surviving. Ditto for All In Magazine.